Although there are great synergies between TOC and Scrum, there are also vast differences. Both provide patterns to resolve systemic problems akin to those described in Systemsâ€™ Thinking by Senge, but TOC resolves systemic problems that are more akin to process improvement ala TQM, rather than complete overhauls as in BPR, which I argue, is closer to what Scrum does â€“ it reengineers the process from scratch, by implementing high performance patterns altogether. For the most part, TOC, and The Goal, assume a somewhat repeatable business process, where the process of removing constraints, exploiting constraints, finding new ones, etc. ; is an ongoing process in a somewhat stable, repeatable process. â€œhas been removedâ€, and that we can move on to new ones at that point. It is usually the case, however. Another important difference is that a Scrum team is already an organizational structure that avoids process anti-patterns like handoffs, iteration and re-work (among different organizational structures, between an â€œanalysisâ€ team and a â€œdesign teamâ€ for example, or between an organizational structure building component A, communicating with another one building component B, in a Conwayâ€™s Law configuration i.e. where Organization Follows Architecture. In that sense, a Scrum team is a true â€œCase Teamâ€, as termed in Michael Hammerâ€™s BPR, i.e. an organization structure that is *completely responsible* for the success of a process or project, where the ScrumMaster is the â€œCase Manager* ala Hammer, that responds to the Product Owner. From the Knowledge Management perspective, TOC optimizes the process and therefore, more knowledge of the processes themselves are more valued, while in the Scrum (Case Team) perspective, the individual contributorâ€™s knowledge is more valued. On the other, and to make things slightly more complicated, Scrum sits atop a number of processes, that as more applications of the same kind are built, tend to be more repeatable, like configuration management, testing of certain components, vertical slice development or new applications on top of reusable architectural services. 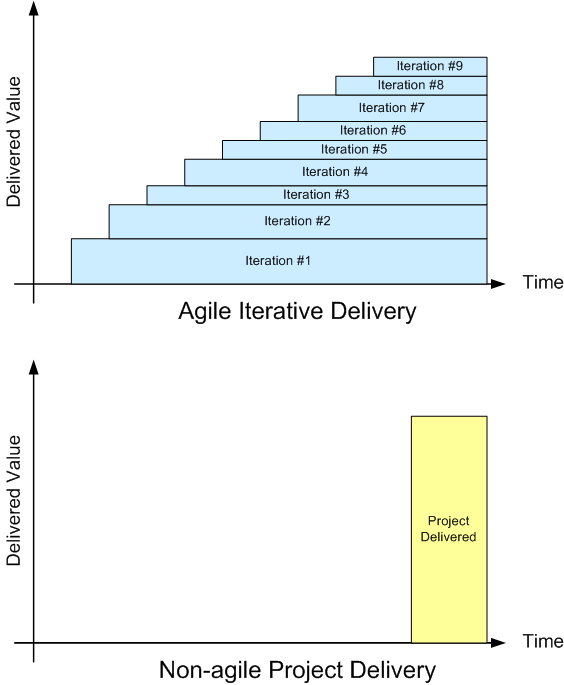 The interesting thing to note, is that in Scrum, smaller reusable processes develop underneath as a base of knowledge but they donâ€™t drive development, while the Scrum process, acts as a â€œwork generator/work managementâ€ â€œprocess envelopeâ€ (a superprocess, or meta-process, if you prefer), that drives the work. (In Complexity terms, it is the Maxwell Demon that provides the autocatalytic cycles to drive self-organization, ala Kaufmanâ€™s â€œOrigins of Orderâ€. Curiously, manufacturing is turning more and more to the original BPR patterns to build things. However, New Product Development always requires one meta-level more of work organization to handle the variability of â€œbuilding something new every timeâ€. In software development this difference evolves into a more continuum spectrum. The first application in a domain is New Product development, but as new ones get added, only a percentage is New Product development, the other percentage is more like manufacturing, and therefore more repeatable. My wife and I have been doing weekly iterations to deal with our household management stuff. As we go along, we are definitely getting through the high-priority items on our household backlog. Along the way, we have encountered a couple of glitches. 1. We missed doing our weekly planning meeting one week. Basically, it was a really busy weekend with way too much stuff going on, both expected and unexpected. We simply failed to remember to do our planning meeting until it was too late to fit it in. 2. Most weeks we miss a number of items that we have selected to complete that week. It can be anywhere from 10% to 70% of the total number of tasks. Usually we get the “larger” tasks done and it is just smaller stuff that we miss. 3. I don’t have nearly the same visibility into the work as my wife does. I travel and am away from home four days a week. As a result, I don’t get to see the state of the house or participate in daily planning except for the three days that I am home. So, we’ve discussed these things and decided that one thing that will help is to create an information radiator. We will be putting up our weekly selection of tasks on yellow sticky notes on a prominent wall in the hallway between our bedrooms and the rest of the house. The location is a compromise between visibility and privacy. We don’t want the tasks to be in a public portion of the house. We hope that having the tasks up will allow me to be a little more conscious of the work that needs to be done. As well, it will be a frequent reminder of what is left to accomplish. I hope that this will be a fairly easy and valuable addition to our agile household management process. Why smart people defend bad ideas by Scott Berkun looks at a fascinating, and fairly common, problem. Interestingly, this problem of smart people doing dumb things / defending bad ideas, is often related to perception. Agile principles and practices are about aligning perception among all the stakeholders, and in particular, between an execution team and the rest of the stakeholders. By aligning perception, the best environment is created for doing the right thing. In the case of a business, your project teams are the experts in “how” to do stuff, and your business teams are the experts in “why” to do stuff. This combination of “how” and “why” is done as efficiently as possible using agile work methods. Our effectiveness as creators depends greatly on our knowledge and our skills. Less obviously, our effectiveness as creators also depends on our emotional and mental state, and even what some would call our spiritual state. Finally, our ability to create can be greatly magnified or greatly reduced by our environment, particularly the other people who are around us. Which is interesting, because our creative nature affects our environment. Our senses and the devices we create to extend our senses, are filters through which we perceive reality. We don’t get to sense all of reality. Then, our minds take in the streams of information from our senses, and filter them further. Our attention or focus, our preconceptions, our mood, all determine the way we filter information from our senses. If we are feeling guilty, we may be more likely to hear other peoples’ conversation as criticism. If we are feeling proud, we may be more likely to hear those same conversations as praise. If our perceptions are wrong then no amount of logical excellence will give the right answer. So it is a pity that almost the whole of our traditional intellectual effort has been directed at logic and so little at perception. Experienced, smart individuals who work together effectively will always perform better than junior untalented people thrown together at random. The experienced effective group will build its own tools and create its own processes. The random junior group will be unable to effectively utilize tools given to them, nor will they be able to effectively follow a process. When a team needs improvement, don’t impose a process or throw tools at them. Instead, concentrate on improving the team and the individuals within it. Technical, personal and team training and coaching will always be time and money well-spent. Spending money on processes and tools before an excellent team is in place can be very risky and wasteful. Nevertheless, processes and tools still have some importance. Great people with a great flexible process and great flexible tools will be hyper-productive. A junior group may need training on tools that will help them be more productive. Just be sure to never let processes and tools get in the way of the team. In many ways, improving people is a sufficient practice for agile work. All the other principles, disciplines and practices would eventually arise out of this one practice. However, the depth of individual and group improvement needed for this practice to stand on its own is very great. Therefore we make the other principles, disciplines and practices explicit. As the change team works on the ideal state and the present state [of the corporate culture], it probably has to periodically redefine the change problem in terms of the gap or gaps identified. In other words, though the process is a set of steps undertaken in sequence, there are many feedback loops that force going back to earlier steps to guarantee clear thinking. . . .
As various gaps are identified in concrete form, it becomes apparent where cultural assumptions aid or hinder the change agenda. For example, having sales teams work together on big accounts may sound simple until it is discovered that the organization’s individualistic culture prevents changing the incentive system to a group-based compensation program. The change program then has to shift to examining how to change some of the individualistic assumptions; this might entail an entirely new change program not previously thought about at all. In other words, expect and embrace changes in understanding brought about by learning from work performed. Deliver corporate culture change work iteratively. Plan corporate change adaptively. People are creators: we willfully change our environment, we imagine new things and through our actions, manifest those things in the world. All people do this. Human beings enjoy having an effect on their environment and seeing the results of that effect. We all have this ability. We all derive satisfaction from the exercise of this ability. And we can all learn to improve this ability. In any endeavor we take on, we are attempting to create something new. A new system, a new object, a new pattern of behavior, or a new way of thinking. We are attempting to create change. This is one of three fundamental axioms of Agile Work. Waste can be of several different types. Independent of what the types of wastes are, they can also come from different sources. When attempting agile work, it is essential to identify the underlying causes or sources of waste. Once these sources are identified, efforts can be made to change them so that they cause less waste. In an agile environment, all work done needs to be directly related to the needs of stakeholders. Stakeholders request or “pull” work from the team, and they do this by defining prioritized work packages. The team needs some way to know when they have completed a work package, so both work packages and iteration tasks need to have testable acceptance or success criteria. The team collaborates with the stakeholders to determine what needs to be done to successfully complete a work package. I heard a story about a situation where someone was refused career advancement because she had made an enemy a long time ago. Can be found here. It is very bare-bones and will eventually be fleshed out. 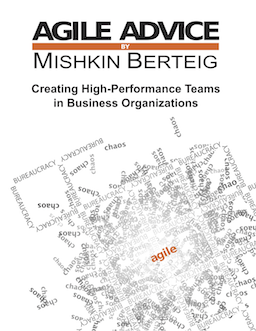 Presents the outline of the basic axioms, disciplines and practices of working agile. Please feel free to contribute.